It takes a special scientific mindset to participate in early drug development – to explore new compounds, study them in depth and critically evaluate their promise as therapeutic agents. 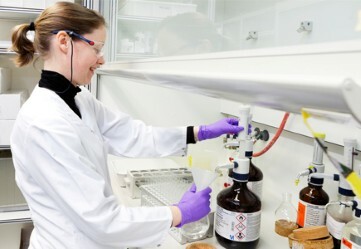 Discovery scientists must efficiently test and critically evaluate many compounds, knowing full well that while many may be scientifically promising, not every project will come to fruition. This approach enables us to fully leverage our advanced discovery platforms and technology portfolio against clearly defined medical needs, therapeutic pathways and targets. Our high level of integration and strategic alignment also ensure that deep expertise in target disease areas is cultivated across the multiple disciplines involved in successfully delivering a new therapy from laboratory bench to patient. Our goal is to achieve the full potential of translational medicine – to connect what we learn in the laboratory to deliver truly meaningful clinical benefit as rapidly as possible. 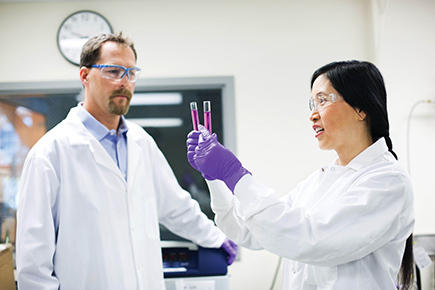 We have core strengths and infrastructure in discovery, development, manufacturing and monoclonal antibody technologies, and we are leaders in the development and use of new biologics platforms. We know that no one company, no single academic institution, can solve the challenge of cancer. Through our research partnerships we are bringing together the best scientific minds in industry and academia – wherever they may be, inside or outside our company – to confront the cancer challenge.